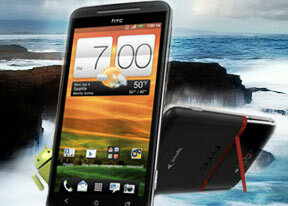 The HTC Evo 4G LTE comes with Android 4.0.3 and Sense 4.0 - both the latest and greatest Google and HTC have to offer. We've already seen those in action on the One S, but Evo 4G LTE offers even smoother performance and higher resolution. There are no surprises though, nothing exclusive on the Evo 4G LTE that is not present on the One S as well. Still we are going to explore the Android/Sense combo once again for you. You've already heard about the new screen - it's really awesome and the OS and the Sense UI look even better on its HD resolution than on the One S qHD. The Evo 4G LTE offers probably the best smartphone experience to date - both visual and functional. But that's not the end of it - the HTC Evo 4G LTE comes with eight different lockscreens preinstalled. You can access the others from the Personalize menu. Unfortunately, you can't download new lockscreens off the HTC Hub. HTC have done a lot to streamline the lockscreen and the same goes for the homescreen. Gone is the scrolling indicator arc, gone is the three button dock that wasn't very useful. Switching between scenes takes a couple of seconds, but they're a handy feature if you use your Evo 4G LTE as both work and personal phone. The main menu has the typical grid layout, which is composed of horizontal pages with shortcuts sorted alphabetically. You can set different sorting options - alphabetical, most recent or oldest - but you can't rearrange them manually. There are Search and Play Store shortcuts along with a menu for some options. The old setup of picking a widget and then picking the size (if any) seemed simpler. The notification area no longer has the list of recent apps - it's all available to notifications only. No more tabs and toggles either - you get a Settings shortcut here if you need to power something on or off. There's also a Clear button to dismiss all notification or you can swipe them off one by one. You get the old task manager too. It's simple to use - each running app is listed with an indication of how much RAM it's using (no CPU usage reading though). You can terminate apps one by one and there's a Kill All button too. The Qualcomm Snapdragon S4 in the HTC Evo 4G LTE is just a solid a performer. Due to its newer architecture, it outclasses the Tegra 3 chipset of the HTC One X for example. The Benchmark Pi result of the Evo 4G LTE is the second best we've seen to date. Linpack tested in multi-threaded mode on the other hand, showed that two Krait cores outdo the Tegra 3 quartet. The 3D graphics department is handled by Qualcomm's Adreno 225 GPU. Unsurprisingly, the Evo 4G LTE posted a score which was in line with its Snapdragon packing relative - the One S.
The HTC Evo 4G LTE is certainly one of fastest phones currently on the market - there's no test in the mobile world it can't pass with flying colors. The Snapdragon S4 equipped version also clearly shows that there's more to performance than just the sheer number of CPU cores.